The Yemeni capital of Sanaa has been controlled by the Shiite rebels. 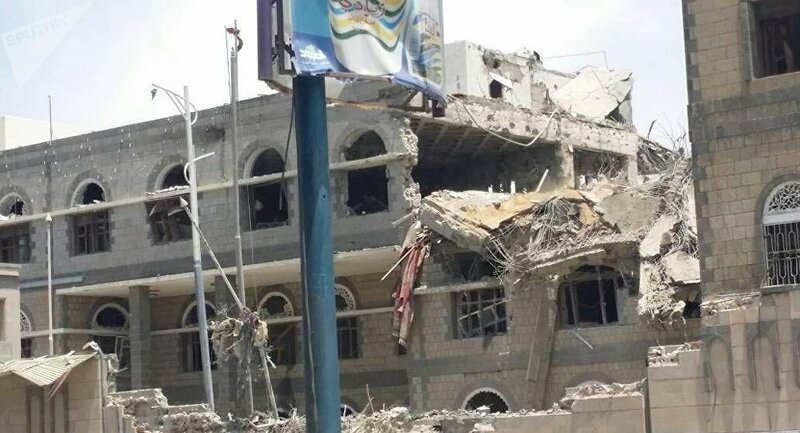 A Yemeni Defence Ministry source told Sputnik that the coalition had carried out two airstrikes against the building. There has been no information if any of the leaders were inside the palace at the time. The number of people who have died in the airstrikes conducted by the Saudi-led coalition on the Yemeni capital of Sanaa, which is controlled by the Shiite Houthi movement, increased to 15 people, a source in the medical services told Sputnik on Monday, adding that 55 more people were injured. According to the source, there were children among the victims. The complexes of the Ministry of Internal Affairs, the Ministry of Defense, as well as the headquarters of the rebel leaders of the Supreme Political Council in the capital district of Al-Tahrir were bombed. Yemen has been engulfed in a violent civil war between the government headed by President Abd Rabbuh Mansur Hadi, and the Houthi movement. — SDGs Yemen (@SDGs_Yemen) 7 мая 2018 г. The Saudi-led coalition, consisting mostly of Persian Gulf countries, has been carrying out airstrikes against the Houthi movement since March 2015 after it started a campaign to support President Abd Rabbuh Mansur Hadi, who fled the country when Houthi rebels conducted a takeover in the country.